The United States Army has selected a private contractor that will be responsible with developing a hybrid Humvee battery that will be used by the military in the United States and overseas. Specifically, the company selected will be responsible for developing new batteries for the vehicles. The Army will work with EnerDel, which is expected to work with the Army Tank Automotive Research, Development and Engineering Center for 18 months. 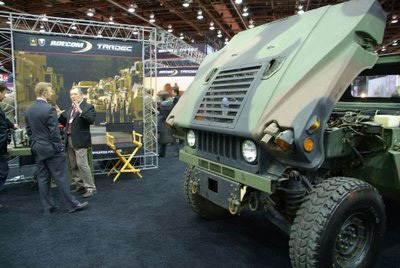 The company is expected to help develop four prototype power systems that could be used in the new XM1124 Humvee. The XM1124 Humvee has been in development for some time, with each branch of the U.S. military trying to go green. Millions of dollars are spent each year to fuel aircraft, ships, tanks and other military vehicles — President Obama and other government insiders have expressed interest in increasing development of biofuels and more fuel-efficient ability. Compared to the current Humvee, the XM1124 has faster acceleration, a higher maximum speed, and is more fuel efficient. It’s unknown when it will be used in future troop deployments, but the Army is working with contractors to ensure the new hybrid vehicles have the necessary armor and features soldiers need.